This is a follow up to my "time lapse photography using an arduino to drive a Sony Alpha-100 DSLR" post -- basically I fixed it to 'do it right' instead of it being a horrible hack. 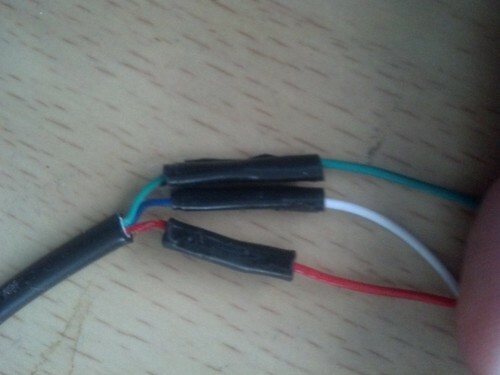 Buy a cheap (~$7.00) shutter release cord to sacrifice to the project. Carefully cut and strip the wires from release cord. Shorting the green and blue wires causes the camera to focus. Shorting the green, blue and red wires after focusing causes the camera to shoot. Remember that my soldering days are long ago (hey, it was only an EE minor) and have one of the kids at our FIRST Robotics do it for me. Here is the result. Note that blue->white. 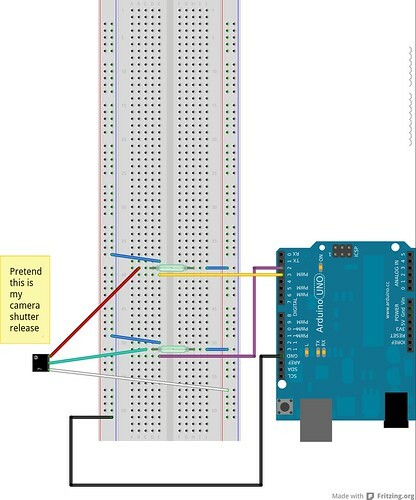 If you connect the release to the camera while the camera is on, even if here is no power to the arduino, it will take a couple photos. That is the kink. Just connect it up with the camera off and it will be fine. Consider setting the photo size to 'standard' -- it saves a lot on disk space. Now find something interesting to point your camera at and come back later. In my case it was our backyard the day after the Nemo Blizzard of 2013 (we got all the snow overnight, so it isn't riveting content). Download all the photos to a directory and use this linux command to convert the JPG images to an AVI file. Before uploading to youtube, I ran it through Handbrake to knock down the size from 260M to less than 70MB.